Lane Windham, winner of the 2013 Reed Fink Award in Southern Labor History will present on her dissertation topic, “Knocking on Labor’s Door: Union Organizing and the Origins of the New Economic Divide (1968-1985)” on Monday, April 14. The presentation will take place in Georgia State University’s Department of History, 34 Peachtree Street NW, in lecture room 2131 at noon. Windham is a former media outreach director of the AFL-CIO and is now pursuing her doctorate in U.S. history from the University of Maryland. She studies the history of how organized business has affected the U. S. political economy, and how the history of labor unions and class intersect with race, gender and the social welfare state in post-World War II U.S. history. 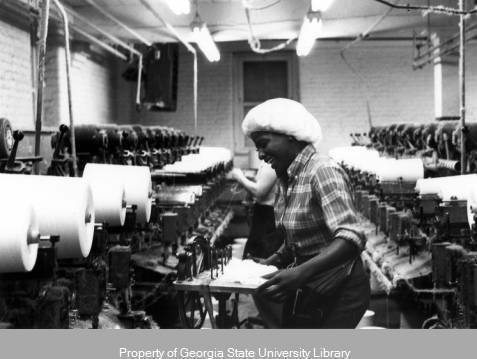 Her dissertation asserts that workers were actively forming unions in the private-sector throughout the 1970s, and that they did so with momentum from the civil rights and women’s movements. Her talk will cover how the U.S. forged today’s economic divide in the 1970s. Yet working men and women did not give up so easily. They continued to try to form private-sector unions throughout the decade, gaining new momentum from the civil and women’s rights movements and knocking on labor’s door. Four case studies illuminate their struggles: the largest-NLRB election in the South, among Newport News, Virginia shipyard workers in 1978; campaigns in 1974 and 1985 by Cannon Mills textile workers in Kannapolis, North Carolina; the 1979 campaign among 5300 department store at Woodward & Lothrop in Washington, DC; and the women office worker’s group “9to5” in Boston who forged a new kind of labor organizing. Applications for the 2014 Reed Fink Award in Southern Labor History are now being accepted; the deadline is May 15, 2014. The award is administered by the Southern Labor Archives. This entry was posted in For Faculty, For Graduate Students, For Students, General News, History, Special Collections & Archives, Uncategorized. Bookmark the permalink.